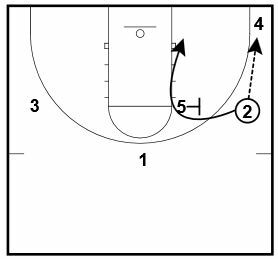 2 quick hitters to run against a 2-3 zone. 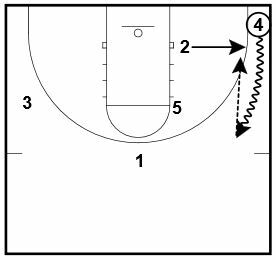 One to get a corner 3 and one with several options to finish. The plays are from Scott Peterman’s Ultimate Zone Offense Playbook. The Playbook contains 123 plays versus zones. That playbook is combined with the Ultimate Horns Sets Playbook as this week’s X and O featured bundle. 1 passes to 3 and cuts to the left wing. 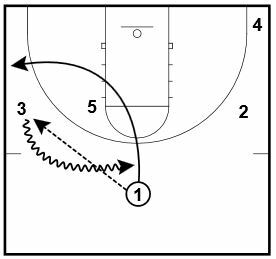 3 dribble to the top of the key. 3 passes to 2 and cuts to the left wing. 5 slides to the right elbow. 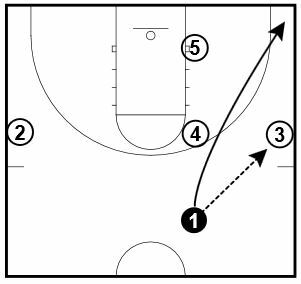 5 sets a screen for 2 who cuts to the right low block. 4 dribbles out of the corner taking the low defender with him. 2 sprints to the corner. 1 passes to 3 and cuts to the right side corner. 1 cuts from the right corner to the left corner. 4 pops out to the top of the key. 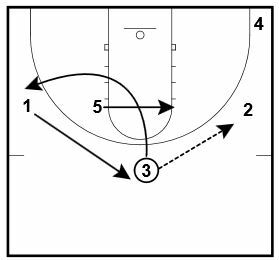 4 passes to 2 then cuts to the left side low block. 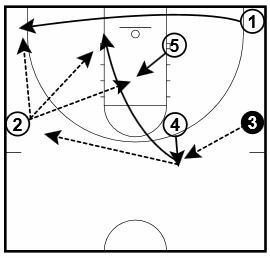 5 steps into the middle of the lane as a scoring option. 2 can pass to 1, 4, or 5 or could skip back to 3.